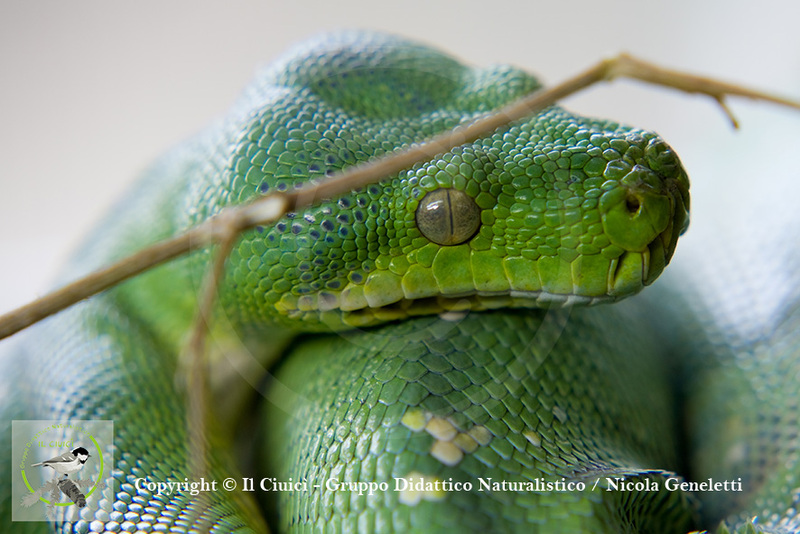 Morelia viridis (Schlegel, 1872) also known as green python or python green arboreal. Some snakes family Boidae (boas and pythons) and Crotalidae (rattlesnakes, vipers of the palms) possess a special sensory organs sensitive to heat, the heat-sensitive dimple. These receptors are heat sensitive to infrared radiation of a wavelength of about 10 microns. Dimples thermosensitive allow snakes to find warm-blooded prey even in complete darkness (can detect temperature differences of only 0.003 ° C). They are covered with sensory cells able to sense changes in the radiated heat. May be present, depending on the species, on the lower lip, on the upper or on both. boa, cold blood, crotalus, dimples, heat, Morelia viridis, organ, receptors, reptils, snakes, thermosensitive.